I have problem to setting up a 4 monitors computer. I bought a Gigabyte GV N750OC 1GI which can support 4 monitors simultaneously, but in my Window XP only can make 2 monitors active with Nvidia Control Panel... Should I upgrade to Window 7 to enable 4 monitors simultaneously? Although you might run 4 monitors on one card (Nvidia MultiView) using Windows XP, you should definitely upgrade to Windows 7 to avoid further problems. It is very old and your videocard / drivers / Nvidia MultiView might not support 4 monitors. IMPORTANT: For ALL (99.99%) of video cards, you CAN'T connect more than 2 legacy connectors (DVI, HDMI or VGA) otherwise you'll get blank screens on the other monitors. This means that for your Gigabyte GV N750OC 1GI card you MUST connect 2x DVI monitors and 2 HDMI monitors. 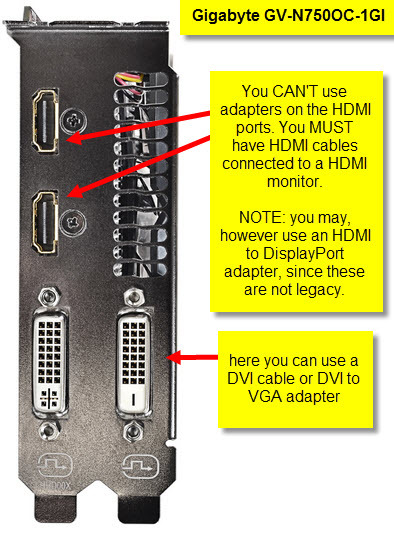 You CAN'T use a HDMI to VGA or HDMI to DVI adapter otherwise the other monitors won't be active. NOTE: you may, however use an HDMI to DisplayPort adapter, since these are not legacy. This is because videocards have a physical "clock" limits for old / legacy connectors.